Explain how AI can make sales reps more productive. List the components for a basic AI solution for sales. Explain how Sales Cloud Einstein makes AI accessible to all sales teams. You’re a sales ops manager and Salesforce administrator at Honeydew, a company that makes inventory apps for grocery stores, restaurants, and food distributors. Honeydew is only a 3-year-old start-up, but its products are already used by businesses across the country. Recently, Honeydew’s management noticed that business is a bit stale. 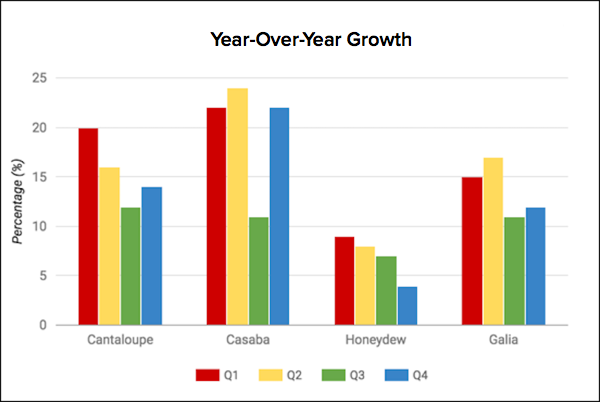 Compared with its top 3 competitors, Honeydew is struggling. An already low year-over-year growth dropped each quarter last year. This downward trend is especially alarming, because the entire food industry has become very crowded, due to the sky-high popularity of food TV shows. Honeydew isn’t converting leads and closing opportunities as fast as their competitors. And their subscription renewal rate has been as flat as a tortilla. Ava Cado, Honeydew’s VP of Sales, asked the sales team to find ways of increasing revenue. As Honeydew’s foremost CRM guru, you have a special assignment: Find ways of harnessing the latest technology to boost sales productivity. It’s a challenge and you love challenges, so you know it’s go time. You grab your triple espresso and start your research. A few hours later and nothing. You find the usual “work smarter, not harder” seminars and books. But your team already works smart, so they’re not that useful for you. Then, after your third coffee, you hit upon two words that have the tech world abuzz: artificial intelligence. You thought artificial intelligence (AI) belonged only to the realm of autonomous vacuum cleaners, crime-fighting sports cars, and eerily calm spaceship robots. It turns out AI is the way of the future in all aspects of business. AI has changed quite a bit in the last 20 years. You can find AI solutions in nearly all sectors and industries, including service, e-commerce, and manufacturing. Ordinarily, your sales reps do all this legwork. With an AI solution for sales, they can optimize their time and focus on the mission-critical part of the job: developing customer connections. AI doesn’t replace sales teams. It makes them more productive. You share your findings with Ava, and she’s elated...at first. Then she remembers a recent sales conference where she met someone from Cantaloupe, a competitor. He bragged about how transformative his company’s $50 million AI solution was. But Honeydew doesn’t have $50 million to spend, and Ava worries AI might be out of reach. That sounds like another challenge, and we know how you feel about challenges. The results were astounding: Cantaloupe transformed its business and went on to lead the industry. And it only cost the company a few million dollars to develop their AI formula. It’s not just companies like Cantaloupe. In recent years, AI solutions have fetched a hefty price. 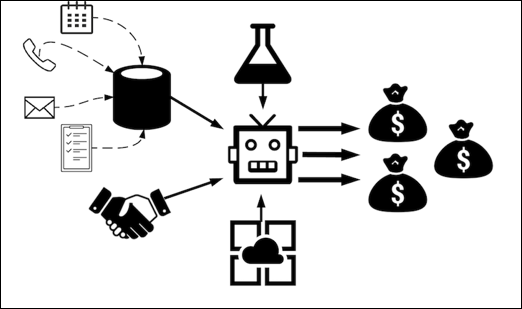 According to the Wall Street Journal , AI platforms for business started off as a multimillion-dollar enterprise. The Epoch Times noted some of the more well-known AI solution acquisitions. Most AI solutions for sales require numerous people working on big data, sales info, algorithms, and apps. All of that is expensive. Input all data into one system. Develop ways of cleaning and normalizing the data. Acquire and maintain computers that store and process all the data. Outline what reps do at each stage of the sales process and determine which insights can be helpful. Insights differ during each stage: prospecting for leads, closing deals, and maintaining customer relationships. Algorithms Data scientists Develop sophisticated computer programs that learn from new data. Apps Engineers Create and maintain apps to display the results of the algorithms. The high price that companies like Cantaloupe have spent on AI solutions is exactly what Ava worries about. With a tight budget, Honeydew is certainly no Cantaloupe. You start to feel a bit discouraged. Honeydew can’t afford a team of scientists working years to come up with an AI solution. Most sales ops managers would be ready to give up at this point. But you’re not most sales ops managers, are you? A few days pass and you’re still on the trail of a solution. You’re about to head back to the kitchen for a protein bar when you happen upon a blog post: Introducing Salesforce Einstein–AI for Everyone. Could that be right? AI for everyone? No team of data scientists necessary? No need to wait years for results? It’s like the writer is speaking directly to you! Salesforce Einstein’s product for sales is Sales Cloud Einstein, and so you also check out the price for Einstein and it’s well within Honeydew’s budget. In fact, it’s so affordable that you do a double take. But how is AI so affordable all of a sudden? It turns out there are three reasons. Sales Cloud Einstein uses all these and more to provide a complete AI solution for sales teams. It includes the same items that Cantaloupe had in its AI solution, but without the need for additional staff members. No writing code, compiling sales info, creating algorithms, or building apps. And that will save Honeydew a huge amount of money. Big Data 0 extra staff Sales Cloud Einstein takes care of it. Sales Info 0 extra staff Sales Cloud Einstein takes care of it. Algorithms 0 extra staff Sales Cloud Einstein takes care of it. Apps 0 extra staff Sales Cloud Einstein takes care of it. Total Cost $50 per license See our pricing page for full details. Plus, instead of taking years to develop, Sales Cloud Einstein provides key predictions, intelligent recommendations, and timely automation immediately. And like all good AI solutions, it learns from your CRM data and sales activities, and its predictions and recommendations get better over time. It’s almost too good to be true. In fact, it’s so awesome that you add #itjustworks to the email you send Ava where you tell her the good news about Sales Cloud Einstein. Sounds like another challenge. You know what to do. Read on to see if AI really can transform sales productivity. Use these resources to learn more about AI and Sales Cloud Einstein.